The content of caffeine in green tea – Caffeine is a substance found in green tea that sometimes give a bad effect on health. If you want to eliminate caffeine from your diet, then you should avoid green tea or put it into the list of forbidden foods. However, if you want to reduce the caffeine, maybe you can replace coffee with green tea as a refreshing drink in the morning. Then what about the facts behind the green tea you drink every day. Let us consider a few facts rarely know about green tea. If you frequently drink coffee in the morning as a pick-me-up drink, try to replace it with a cup of green tea. Replace coffee with green tea could reduce the amount of caffeine to 70% (Drinking green tea with the same amount of coffee). In one cup of coffee contains up to 100-150 mg of caffeine. While a cup of green tea contains only 25 mg of caffeine. However, the caffeine content is also dependent on the type of green tea, because some variations of tea contains caffeine in greater numbers. Green tea is not only contain caffeine but also contains two kinds of other substances, namely theobromine and theophylline. These substances work is similar to caffeine, it affects heart rate and the nervous system. For those of you who do not drink tea can also get these substances by eating chocolate. The effects of caffeine in coffee may affect on weight loss, bad breath and dental health. For those of you who want to stay away from caffeine that green tea is the best choice for you. Green tea has many health benefits such as increase metabolism, burn body fat, as anti-biotic and nice to kill bacteria in the mouth. 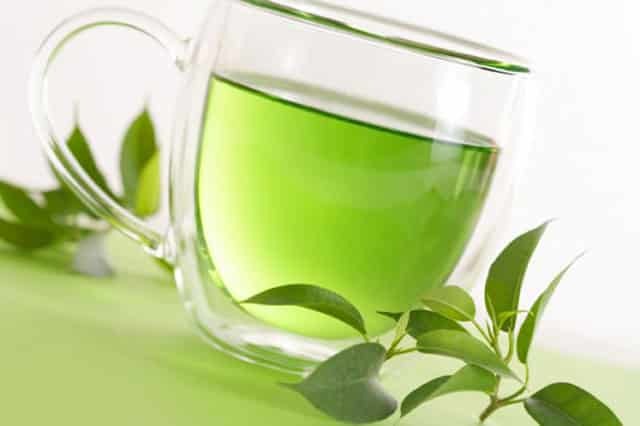 Green tea, in addition to eliminating bad breath is also good for heart health. The effects of caffeine, theophylline and theobromine in green tea can walk in balance with other substances in green tea. One of them is the amino acid L-Theanine. All of these substances can work in calming the nervous system and improve concentration. Before you leave drink coffee because some health effects like feel anxiety and insomnia or irritability. Try to think back, whether it arises because the effect of coffee, because the amount you drink, when to drink or as you add other substances as a sweetener. It is important to consider, because it could be bad for health effects that result from the large number of coffee you drink or the wrong time. Why is it important? Because the caffeine levels in certain circumstances also good for health, especially in the fight against Parkinson’s disease and colon cancer, and liver. Then, choose the beneficial green tea same as choosing other foods. Green tea that beneficial for us is tea that not chemically treated. Most green tea is now packaged in a bottle with a blend of various sweeteners, such as fructose and others. This drink is not good for health of the body. Choose green tea bags that are not chemically though, you can make this drink at home by giving a bit of natural sugar. One of the green tea that free from caffeine is decaffeinated tea. So, for those of you who want a caffeine-free diet, you can buy this tea as pick-me-up beverage. Those are some facts about green tea should be known. Let’s take the benefits of green tea by choosing natural green tea without preservatives or artificial sweeteners.